Are there any rules in cartooning ? Yes, there are. Hundreds probably, but most of them are best known to students of cartooning rather than cartoonists [well at least, this cartoonist who finds scholarly texts on humour a bit anaesthetic] Here are a few which probably don’t appear in learned treatise on cartooning. “Up there” refers of course to the upstairs bedroom, or “studio” to those who’ve never seen it. This cartoonist lives in awe of colleagues whose working spaces can double as operating theatres. On the other hand, it must be a bit boring not finding the upright piano you thought you’d lost, from time to time. And you musn’t steal others’ gags, which is an absolute no-no. It doesn’t mean that two cartoonists won’t come up with the same gag at the same time occasionally, but in an age of instant internet access, its all too easy to nick ideas. That’s not to say that you won’t be influenced by other cartoonists’ humour and that inevitably leads to similar scenarios. During those bleak days when the ideas just won’t come, I often wish I was Bud Grace or Mike Williams. But then I’ve seen Mike’s spotless studio and realize I’m not. On the other hand, can Mike talk to the spiders ? Then there’s the thorny business of pricing. Cartooning’s a weird business. Much-loved but not generally well – paid. Not as well paid as the technician who comes to fix the machine which prints the magazine the cartoon appears in. So pricing’s a lottery. You ask £200 knowing that you’ll do it for £100. So really, that’s about it. Ask another cartoonist and you’ll probably get a whole slew of different answers. There is one common factor though – a dreaded and terrible one called Her Majesty’s Revenue and Customs. Never mess with the pointy-heads. Always remember that going after a sole trader is dead easy for HMRC – far, far easier than nailing big rich tax avoiders. 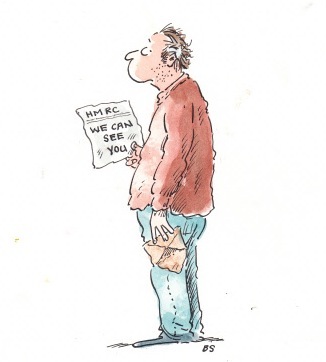 I did a couple of cartoons for HMRC ages ago, all about tax evasion. Felt strange. A bit like Joan of Arc reaching for her Zippo. I love this post! er oops, Mr Stock. No! I meant Mr Snot – arrghh! Bill, I really enjoy being a complete stranger reading your blog and laughing – in the presence of my bewildered family (at my laughing not me in general…) – at your cartoons. Your style is inspirational and I will be studying hard your line and colouring tomorrow, this week and all the way into the near future, until that is I have to leave the computer for a pee. doodling UK born Art Teacher, now living in Oslo, Norway.